GENEVA � Over 57 percent of Swiss voters on Sunday approved a blanket ban on the construction of Muslim minarets, according to official results posted by Swiss news agency ATS. A final tally of 26 cantons indicates that 57.5 percent of the population have voted in favour of the ban on minarets — the turrets or towers attached on mosques from where Muslims are called to prayer. Honestly, I think that this should be the policy of the west until Muslim countries change their policies toward Churches and other religions/beliefs within their own countries. They’ll complain, but, they haven’t a foot to stand on. Especially the most vocal of the complainants such as Saudi Arabia. The unholy House of Sa’ud rails against intolerance of Islam in other countries, yet, they are intolerant of any other religion or belief within Saudi Arabia–even forcing non-Muslim women to wear the hijab–and are the primary exporters of Wahhabism and Islamic Fundamentalism throughout the globe. All religions are bi-polar. At once espousing peace and war, intolerance and inclusiveness. Islam is no worse a religion than any other in my opinion. It’s leadership, though, leaves much to be desired. 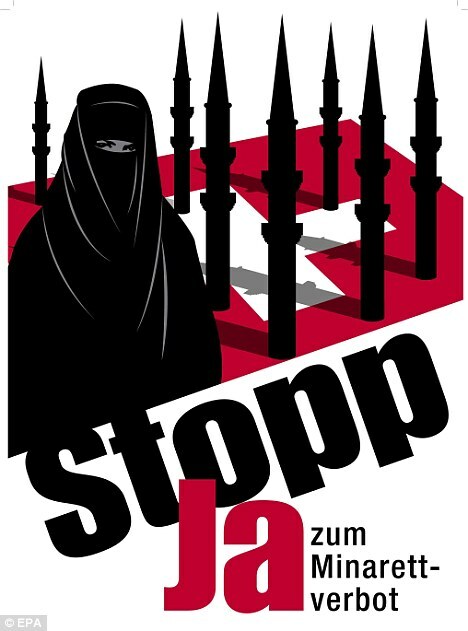 The U.N. Human Rights Committee called the posters discriminatory and said Switzerland would violate international law if it bans minarets. If this is the case, then why is Saudi Arabia not in violation of International law. There are several Muslim countries with these restrictions against building religious structures. Seems a bit of a double standard to me. The UN should clean up the primary violators of international law before they go looking for villains in a country like Switzerland. If a backlash against Islam is in the offing, much of the blame can and should be placed squarely on the shoulders of leadership of Saudi Arabia, Iran, Palestine and Syria. Actually, you are right that all religions are bi-polar. perfectly right, but, we need to live with them. Today, the need is to promote tolerance and it becomes especially important for Islam. Because, this religion has been highjacked by its so called “jihadis”; these people are using Islam as a tool to achieve vexatious motives. I simply submit that this ban will aid these jihadis only and wont make saudi’s understand a bit. Your comments on my blog are extremely welcome.